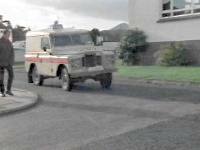 The two schools in Plockton appear in various guises in several episodes of Hamish Macbeth. From the car park in Plockton turn left and head back up the road out of the village. After a hundred yards or so you will pass Plockton Primary School which was used as Esme's school in the series "The Trouble with Rory". At the top of the hill on the right just before you reach the station is the large white coloured buildings of Plockton High School. This appears as the newspaper offices outside which Isobel Sutherland parks her car at the beginning scene of "Isobel pulls it off". 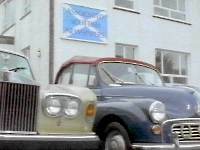 It is also seen as the Council Education office which Esme Murray is given a lift to by Hamish Macbeth in "The trouble with Rory". Take the right turning going to the station and then turn right on the road to the aerodrome. Carry on a few hundred yards and you will go between two playing fields. These appear in "More than a game"as the location where the Lochdubh shinty team is practising at the beginning of the episode and also is where the shinty match with Dunbracken was filmed.